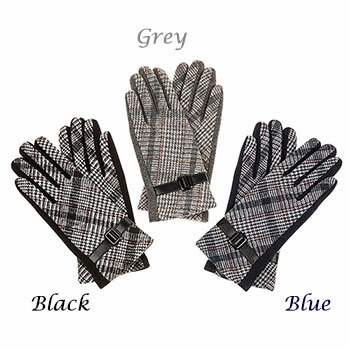 Gloves Traditional Checked Black Gloves Discounts Apply ! The Gloves Fit Nice and are Warm when on. These Stylish Patterned Gloves with a Decorative Buckle and a tweed style are Black on the Finger and Hand parts (on the Reverse) and would lovely with Many Outfits.